This article is about the entertainment district incorporating the former Millennium Dome. For the indoor arena within it, see The O2 Arena. For other uses, see O2. "IndigO2" redirects here. For the Indigo² workstation by Silicon Graphics, see SGI Indigo² and Challenge M.
The O2 is a large entertainment district on the Greenwich peninsula in South East London, England, including an indoor arena, a music club, a Cineworld cinema, an exhibition space, piazzas, bars, and restaurants. It was built largely within the former Millennium Dome, a large dome-shaped canopy built to house an exhibition celebrating the turn of the third millennium; consequently The Dome remains a name in common usage for the venue. It is sometimes referred to as The O2 Arena, but that name properly refers to a smaller indoor arena within The O2. Naming rights to the district were purchased by the mobile telephone provider O2 from its developers, Anschutz Entertainment Group (AEG), during the development of the district. AEG owns the long-term lease on the O2 Arena and surrounding leisure space. From the closure of the original "Millennium Experience" exhibition occupying the site, several ways of reusing the Millennium Dome's shell were proposed and then rejected. The renaming of the Dome in 2005 gave publicity to its transition into an entertainment district. The Dome's shell remained in situ, but its interior and the area around North Greenwich Station, the QE2 pier and the main entrance area were completely redeveloped. The area is served by the Jubilee line's North Greenwich tube station, which was opened just before the millennium exhibition, and by bus routes. Thames Clippers operate a river boat service for London River Services; the present tenants, AEG, purchased Thames Clippers in order to provide river links between central London and The O2. As well as a commuter service, Thames Clippers operates the O2 Express service. Local buses also serve the station and the nearby O2. On 23 February 2017, O2 announced that they had agreed to a deal with AEG to maintain the naming rights of The O2 for a further ten years until 2027. The dome-shaped structure, which now houses The O2's Entertainment Avenue and arena, was originally constructed as the Millennium Dome and housed the Millennium Experience, a major exhibition to celebrate the start of the third millennium. The exhibition opened to the public on 1 January 2000 and ran until 31 December 2000; however, the project and exhibition was the subject of considerable political controversy and it did not attract the number of visitors anticipated, leading to recurring financial problems. In popular usage, the dome canopy is often still called The Dome, reflecting the substantial, and often adverse, publicity given to its building in the late 20th century. The O2 was developed inside the dome structure by Anschutz Entertainment Group to a design by Populous and Buro Happold in a £600 million development. In December 2001, it was announced that Meridian Delta, Ltd. had been chosen by the government to develop the Dome structure, originally the Millennium Dome, as a sports and entertainment centre, and to develop housing, shops and offices on 150 acres (0.6 km2) of surrounding land. There was also a desire to relocate some of London's tertiary education establishments to the site. Meridian Delta is backed by the American billionaire Philip Anschutz, who has interests in oil, railways, and telecommunications, as well as a string of sports-related investments. Meridian Delta, a subsidiary of Quintain Estates and Development and Lend Lease, signed a 999-year lease for the Dome and its surrounding land with the government and English Partnerships, a UK governmental body for national regeneration which was assigned the regeneration of the Greenwich Peninsula. The Dome site was then sub-leased to Anschutz Entertainment Group (AEG), who strongly support Meridian Delta, for a minimum of 58 years. English Partnerships leased the arena directly to AEG Europe for 58 years. AEG would develop and operate The O2 during the length of the lease agreements, which stated that the government would get a certain percentage of profits through English Partnerships. English Partnerships and Quintain Estates and Development both own land around The O2 on the Greenwich Peninsula. They will release land in stages, to developers, and develop the area in a joint venture with the aid of Meridian Delta. Some of the land is already being developed for offices and shops. Some of the land around the dome is being reserved for possible extended developments for The O2, including a hotel, although the building of much of the extended development depends on how much investment can be made by AEG (See below section about possible future developments for details). In 2008, the functions of English Partnerships were transferred to the Homes and Communities Agency. Ravensbourne, a specialist art and design institution previously located in Chislehurst, moved to a new campus built immediately adjacent to The O2 in September 2010. The David Beckham Academy football school ran nearby from 2005 to 2009. The cost of developing the whole Greenwich Peninsula area was estimated at 4 billion pounds in 2006. As part of the investment programme, naming rights were sold to O2 plc, and 'The O2' became the official name of the project on 25 May 2005. The £6 million per year deal between O2 plc and AEG included priority tickets and reserved VIP accommodation for O2 mobile customers. The service was also made available to premium ticket holders. O2 plc started talks with AEG in 2005 to have its logo and branding placed on the roof of the dome, but this did not take place. AEG have constantly stated that they wish to abolish the 'Dome' name due to its reputation as a failed project, being tagged as 'The White Elephant.' Since its opening, there have been signs of the press and public calling it The O2. It is currently the largest entertainment district in London. To mark its opening, AEG spent £6.5 million on a mass advertising campaign, led by VCCP, throughout Europe to promote The O2. The development took place in the form of new buildings being built inside the dome structure. The dome structure was not changed as part of the construction with the exception of blue lights being added to the support poles and plasma displays being added to some of the large sculptures around the dome. Construction started with the arena roof, which was built on the ground and then raised, as cranes could not be used in the dome structure. The construction then moved on to the arena building itself and the entertainment avenue around the arena building. A wide pathway between North Greenwich station and The O2 was also built, as well as the Peninsula Square piazza in front of the dome for special events. A glass roof was built over part of the pathway so that people can walk from the station to The O2 without getting wet in rain. A covered path was also built between the QE2 Pier and The O2's main entrance. Buro Happold provided structural engineering for the project. The main civil engineering and construction contract for the development was awarded to Sir Robert McAlpine. Watson Steel Structures provided engineering for the 4500 tonne arena roof. M-E Engineers were the building services engineers for the project. T. Clarke were the electrical contractors. OR Consulting engineers set up a few interactive exhibitions within The O2. Keller Ground engineering prepared the ground for construction. Special ground preparation was necessary due to the contaminated soils from the industrial works which existed at the site before the dome. Catalytic converters were also installed within the dome to prevent toxic gases due to the dome structure being left in place. The plant cylinders, containing services equipment, and some piles used for the original dome, were reused. Financial consulting was provided by WT Partnership and EC Harris. The Waterfront partnership provided legal support for the development and continues to do so for The O2. Kerzner International helped with the development of the entertainment venues. Anschutz planned to build a 'super casino' as one of the attractions, which would lead to further development of the area. The casino was to be developed and operated by Kerzner International. The association of the British Deputy Prime Minister, John Prescott, with Philip Anschutz, head of the entertainment group, gave rise to political controversy, with allegations that Prescott may have used undue influence to support Anschutz's casino licence bid. Prescott had met Anschutz on several occasions and stayed in his ranch for a few days. In August 2006, it was reported that construction of the shell of The O2's casino site had already started. In January 2007 the single trial licence for a British super casino was granted to Manchester. Consequently, AEG announced that the casino would not be built in the near future, and that there would not be enough investment for a high-rise hotel, designed by Richard Rogers, as well as a theatre, a cable car from Canary Wharf and an extended development that was planned adjacent to the dome. One-third of the ground floor remained undeveloped until 2016, when AEG, working with property firm Crosstree Real Estate Partners, broke ground on the 210,000 square feet Icon Outlet. The shopping outlet, due to open in October 2018, completes the loop of The O2, adding an extra floor in parts and providing space for 85 stores. Brands that have signed deals to take space include handbags maker Aspinal of London, Calvin Klein, Hackett, Ted Baker, Gant and Levi’s. In late 2007, Marine engineering consultancy, Beckett Rankine, were appointed to investigate the possibility of a cruise ship terminal being built. In 2012 it was reported that the O2 would be sold by its owners, Anschutz Entertainment Group (AEG), as part of the disposal of the entire company's assets, rumoured to be valued around $7 billion. The venue, rebranded The O2, was reopened to the public on 24 June 2007 with a concert by Bon Jovi in the arena. The O2 celebrated its first year with a book, including a double page picture of Elton John from his September 2007 Red Piano show. Prior to this reopening, other events took place, including a soft opening for residents of the area to explore the entertainment district and an opening for staff called "The O2 Premiere" which featured Peter Kay, Tom Jones, Kaiser Chiefs and Basement Jaxx. An event called "Out of the Blue" featuring circus acts also took place on the day of the public opening, as part of the Greenwich Festival. The O2 concourse. The arena entrance can be seen in the background. Designed by Jordan Parnass Digital Architecture. Various buildings are housed within the dome structure including an arena, known as The O2 arena, smaller venue indigo at The O2, Hollywood Bowl, Cineworld, Sky Studios and an Entertainment Avenue consisting of various restaurants and bars. A new shopping outlet will open in 2018. Backstage there is also a VIP club lounge, operations rooms, a media centre with high definition facilities and a number of dressing rooms, as well as a VIP entrance/exit for performers. All the venues in the complex use the latest lighting, sound and security technology, including RFID smart card tagging of staff and VIP guests, and digitally managed sound. There are four computer server rooms to provide this technology. The complex is also covered by CCTV and security personnel. Arena visitors and their bags are screened with X-ray machines and metal detectors at the main entrance. 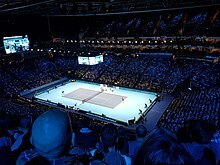 The O2 Arena (referred to as the North Greenwich Arena for the 2012 Summer Olympics and Paralympics) is a 20,000 capacity venue, primarily used for live music. It is located at the centre of The O2 and is the first American-style, multi-purpose arena in London. It is the second largest arena in the UK after the Manchester Arena, but is the busiest music venue in the world. The arena and its facilities are housed in an independent building within the dome structure. The arena has hosted multiple kinds of music and sporting events and in 2008 exceeded ticket sales for both Madison Square Garden and the Manchester Arena. "indigo at The O2" is a 2,750 capacity live music club for smaller music events, club events, after shows, corporate and private events. It contains four bars: two on the main ground floor area in front of the stage, one in the VIP lounge called the Purple Lounge and one in the stalls, called Bleachers. The Purple Lounge is not in direct view of the stage, but guests have access to "Kings Row", the best seats in the venue. indigo at The O2 is managed by Ansco Music Club limited (the business name of the indigo part of AEG Live). The venue hosted "An Audience with Bill Clinton" in 2007. Comedians such as Andy Parsons and Roy 'Chubby' Brown have performed at indigo. Classic FM hosted several shows throughout 2008. The venue hosted the 'bootcamp' sessions for the reality TV show, The X Factor during the 2008, Series 5 season, and in 2010 was used for the debut of the snooker format, Power Snooker. In 2012 it was the venue for a performance by South Korean pop rock band CN Blue. The O2 Bubble was a two-storey bubble-shaped exhibition space built to museum standards, which opened in November 2007. It was made from ETFE, the same material used for the Eden Project, and the bubble itself was reportedly based on the Eden Project. [dead link] Tutankhamen and the Golden Age of the Pharaohs was the first exhibition in the Bubble and after that was Body Worlds. In October 2009 it was Michael Jackson: The Official Exhibition, a collection of Jackson's personal items from his estate and Neverland Ranch, costumes and props from his tours and videos. In 2009, the third floor of the bubble became an exhibition called the British Music Experience, a sixty-year retrospective of British popular music. The space, no longer named The O2 Bubble, has hosted various exhibitions including Star Wars Identities, My Name is Prince, Elvis on Tour and currently hosts DC Exhibition: Dawn of Super Heroes. The Entertainment Avenue is a wide pedestrian avenue within The O2, with artificial palm trees and other decorations, built around the circular arena building which takes up the centre of the dome structure. The entertainment avenue has buildings on either side, which are leased to tenants who run bars and restaurants, and resembles a shopping centre. The buildings on the Entertainment Avenue include a music club known as indigo at The O2, an exhibition space, a cinema managed by Cineworld and 26 bars and restaurants. The cinema includes 11 screens over 2 levels including one 770 capacity auditorium (Sky Super Screen) which is the third largest screen, by screen-size, in London, and the sixth largest screen in the UK. It uses the vista ticketing system, where tickets can be purchased from any stall selling refreshments. Cineworld began operating the cinema, taking over from Vue in 2010. Fast food outlets have been banned from the development as the theme is 'aspirational but accessible', trying to avoid it being seen as a shopping centre but more like Covent Garden. Announced in 2011, Up at The O2 officially opened on 21 June 2012. It involves an expedition across the roof of The O2 along a 190m long tensile fabric walkway. Halfway, a central platform provides 360 degree views of the city, before a descent down to the base of the venue on the other side. From the platform, visitors can see the Olympic Park, Thames Barrier, Historic Royal Greenwich and Canary Wharf. The O2 also has one multi-purpose indoor events space for live music and night clubbing. Competing with other similar events spaces such as Brixton Academy, the club is called Building Six (formerly Matter & Proud2). Special events or minor events which did not require or could not be held in the indoor venues were held in the piazzas – The London Piazza, Peninsula Square outside the main entrance of The O2, and the area around the main entrance. The London Piazza, which had featured an indoor beach, ice rink and dry ski slope, was replaced by the Icon shopping outlet. Hollywood Bowl is a boutique bowling alley and arcade games space within The O2. It also hosts a VR Zone Portal. 1994: The Millennium Commission is established by prime minister John Major and handed over to deputy prime minister Michael Heseltine. January 1996: A site on the Greenwich Peninsula is selected. Birmingham, Derby and Stratford, London were also considered. May 1999: The Jubilee Line Extension opens, putting the dome on the London Underground. 22 June 1999: The structure of the dome is completed. 1 January 2000: The site opens to the public as the Millennium Dome, containing an exhibition to celebrate the third millennium. 31 December 2000: The dome closes to the public. 27 February 2001 – 2 March 2001: One Amazing Auction Sale: Four-day public auction with 17,000 lots of Dome/NMEC items, managed by auctioneer Henry Butcher. 18 December 2001: Announcement of sale of the site to Meridian Delta Ltd, who plan to turn it into a 20,000-seat sports and entertainment venue. Houses and offices will be built on the surrounding land, subject to the consent of the London Borough of Greenwich. 6 December 2003: Winter Wonderland 2003 opens. 31 May 2005: Anschutz Entertainment Group sell the naming rights to the former Millennium Dome to O2 plc, a British mobile phone company. 23 June 2007: The 'O2 premiere' private event opens to staff. Peter Kay, Tom Jones, Kaiser Chiefs and Basement Jaxx perform. 24 June 2007: The O2 opens to the public. Bon Jovi is the first band to play the new O2 Arena. 2 September 2007: Disney channel's High School Musical 2 premieres at The O2; it is the first movie to premiere at the venue. 10 December 2007: Led Zeppelin play a reunion and tribute concert to Ahmet Ertegun. This concert is later released as an album and movie titled Celebration Day. 6 April 2008: The Olympic torch relay passes The O2. 7 June 2010: Bon Jovi become the first band to play on the roof of The O2 to commemorate the beginning of their 12-night residency in the arena. 21 June 2012: Up at The O2 officially opened. ^ "10 more years of The O2". o2.co.uk. 23 February 2017. Retrieved 7 August 2017. ^ "Justin Timberlake". Mycityoflondon.co.uk. Archived from the original on 17 October 2007. Retrieved 27 October 2008. ^ "National Audit Office Report (HC 178, 2004–05): English Partnerships – Regeneration of the Millennium Dome and Associated Land (Full Report)" (PDF). 10 Jan 2005. Archived from the original (PDF) on 10 June 2007. Retrieved 23 November 2008. ^ a b Liam Allen (12 April 2006). "White elephant 'not forgotten'". BBC NEWS. Retrieved 27 October 2008. ^ "Internet Archive Wayback Machine". Web.archive.org. Archived from the original on 24 October 2007. ^ "Dome could be an O2 'bubble'". The Times. ^ Valentine Low (25 June 2007). "Bon Jovi blasts off at the O2 - News - Evening Standard". Thisislondon.co.uk. Archived from the original on 18 August 2011. ^ "Bon Jovi first to play O2 arena". BBC News. 12 April 2007. Retrieved 27 October 2008. ^ "NBA.com – Tickets Sold Out for Celtics vs. Timberwolves at the O2 Arena in London". Nba.com. Retrieved 27 October 2008. ^ More for less (18 June 2007). "Branding the O2: Welcome to the new Dome of entertainment". The Independent. UK. Archived from the original on 16 December 2007. Retrieved 27 October 2008. ^ "Internet Archive Wayback Machine". Web.archive.org. 20 December 2007. Archived from the original on 20 December 2007. ^ "Millennium Dome to become Europe’s largest entertainment zone : Entertainment". Earthtimes.org. Retrieved 27 October 2008. ^ "Press Releases | Chime Communications". Web.archive.org. 26 September 2007. Archived from the original on 26 September 2007. ^ "Sir Robert McAlpine Project Archive". Web.archive.org. 12 October 2007. Archived from the original on 12 October 2007. ^ "Sir Robert McAlpine". Sir Robert McAlpine. ^ "Market Sectors – T. Clarke Corporate Website". Tclarke.co.uk. Archived from the original on 9 June 2008. Retrieved 27 October 2008. ^ "New Temporary Exhibition Projects for OR Consulting Complete – OR Consulting News". Orconsult.co.uk. Archived from the original on 20 August 2008. Retrieved 27 October 2008. ^ a b "The Dome reborn – Building". Building.co.uk. Retrieved 27 October 2008. ^ "Keller GE – Keller Ground Engineering, Case Histories, soil nailing, slope stabilisation". Keller-ge.co.uk. Archived from the original on 8 June 2008. Retrieved 27 October 2008. ^ a b "General Purposes Committee" (PDF). Retrieved 27 October 2008. ^ a b c "Greenwich Peninsula Partnership Forum". Gold.ac.uk. Archived from the original on 8 June 2008. Retrieved 27 October 2008. ^ "Prescott 'broke ministers' rules'". BBC News. 21 July 2006. Retrieved 31 January 2007. ^ "Dome super-casino 'not done deal'". 31 August 2006. Retrieved 4 August 2018. ^ Bourke, Joanna (16 July 2018). "Upmarket retailers sign to open at new outlet centre at The O2". Evening Standard. Retrieved 4 August 2018. ^ "Beckett Rankine – O2 Cruise Terminal". Beckettrankine.com. Retrieved 27 October 2008. ^ Hobson, Sophie (20 September 2012). "The O2 goes up for sale". London Loves Business. Retrieved 5 February 2017. ^ "Bon Jovi open new O2 venue". Inthenews.co.uk. Archived from the original on 24 November 2010. ^ "The Dome puts IT at the top". Computing. 28 June 2007. ^ "Dome's hi-tech refit for The O2". BBC News. 21 June 2007. ^ "The O2 – Venue Access". Theo2.co.uk. Retrieved 27 October 2008. ^ "The O2 – Health & Safety". Theo2.co.uk. Retrieved 27 October 2008. ^ "The O2 - About AEG". Web.archive.org. 11 November 2007. Archived from the original on 11 November 2007. ^ "Power Snooker". Archived from the original on 26 July 2010. Retrieved 24 July 2010. ^ Hong, Grace Danbi (24 September 2012). "CN Blue Showered with Success at London Concert". enewsWorld. CJ E&M. Retrieved 2 March 2013. ^ "UP AT THE O2 ULTIMATE GUIDE". Strawberry Tours. Retrieved 21 December 2018. ^ "The O2 – The O2 bubble". Theo2.co.uk. Archived from the original on 17 December 2007. Retrieved 27 October 2008. ^ "O2 – Why Sponsor?". Archived from the original on 9 June 2008. Retrieved 2 June 2008. ^ "The O2 - Events & Conferencing". Web.archive.org. 7 November 2007. Archived from the original on 7 November 2007. ^ "Cineworld to operate O2 multiplex | Digital Look". Finance.digitallook.com. 25 June 2010. ^ Wallop, Harry (31 January 2007). "The Dome misses out". Daily Telegraph. UK. Retrieved 22 June 2007. ^ More for less (18 June 2007). "Branding the O2: Welcome to the new Dome of entertainment – Media, News – Independent.co.uk". The Independent. UK. Archived from the original on 16 December 2007. Retrieved 27 October 2008. ^ "The O2 Roofwalk given the green light". AEG. 29 July 2011. Archived from the original on 11 September 2011. Retrieved 16 November 2011. ^ "Special Events". The O2. 22 January 2008. Archived from the original on 18 December 2007. ^ "Fans attend musical film premiere". BBC News. 2 September 2007. Retrieved 25 May 2010. ^ Blake, Heidi (7 June 2010). "Bon Jovi play on O2 Arena roof". The Daily Telegraph. Archived from the original on 11 January 2011. Retrieved 11 January 2011. Wikimedia Commons has media related to The O2.